You are invited to the Exposure to Industry Program (EIP) visit the DIII-D National Fusion Facility at General Atomics. 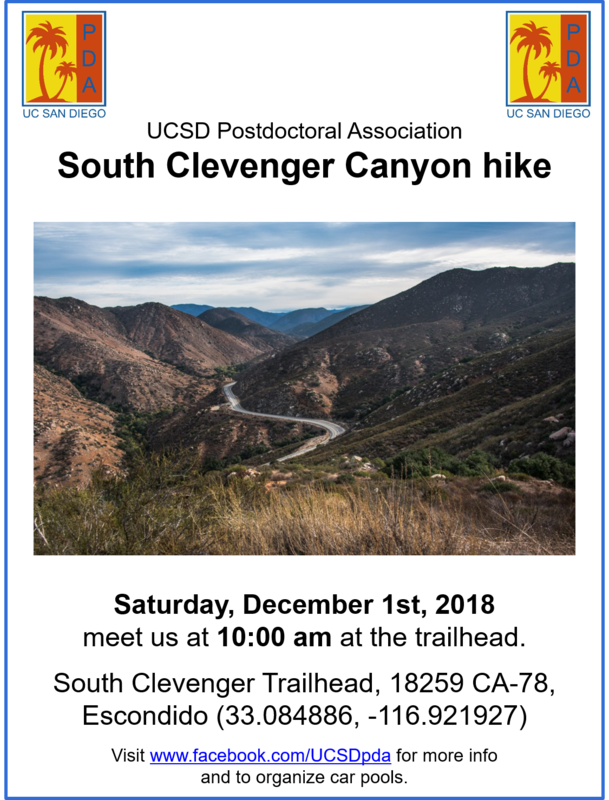 The participants will be introduced to plasma and fusion concepts developed at General Atomics and tour the control room, life-size cross section of the DIII-D device, and see the DIII-D device itself. If time permits, we will also visit the Electron Cyclotron Heating (ECH gyrotrons: 1 million W microwave generators) area and a magnet power supply area. Limited spots are available. To apply, please fill out the following Google Form by Wednesday, April 24th. Friends Dinner Socials are held several times a year providing members from our Friends, international visitor, university and local communities an opportunity to meet and mingle during a casual, family-friendly, affordable evening. 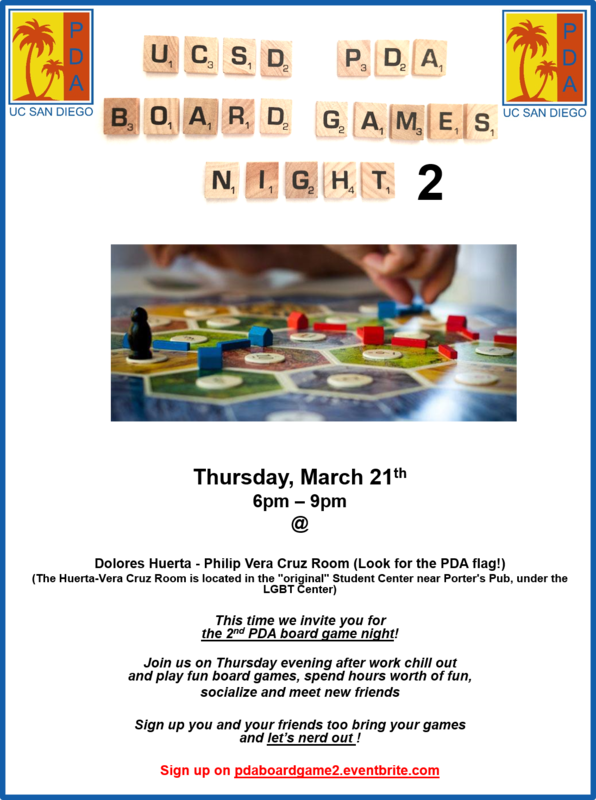 This event is a great way to spend an evening with friends and/or making new friends! The evening begins with a reception and transitions to a seated dinner (open seating) that often concludes with some type of entertainment or presentation that ties in to the thematic cuisine. The program was begun in 2013 by Katya Newmark, Dagmar Bočaková, and Audrey Leriche and became an instant success. Dinners are held in the panoramic 15th floor of Village West located at the north end of the UCSD campus. Reservations are required. After dinner performance by UC San Diego's Dean of Undergraduate Education and Linguistics Professor, John Moore on guitar joined by two of San Diego’s top flamenco performers. 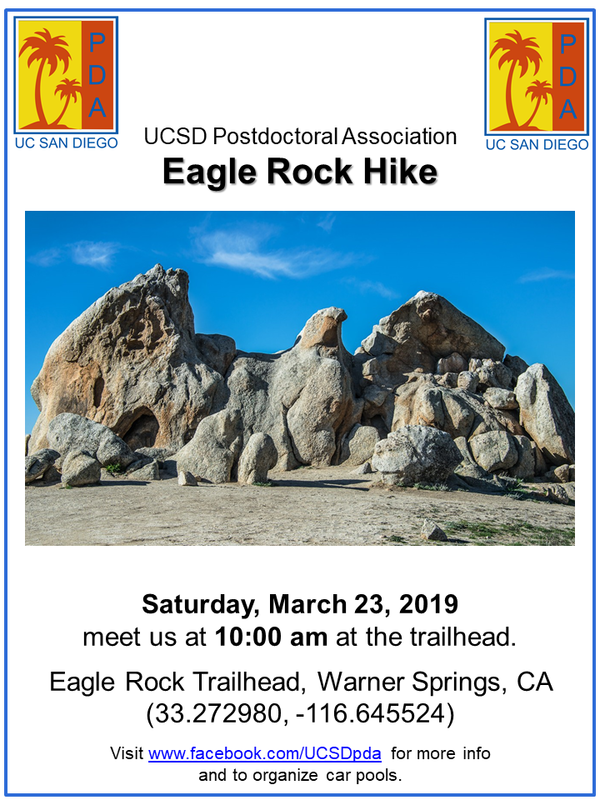 Spend a day in nature and join us for a hike to iconic Eagle Rock near Warner Springs. 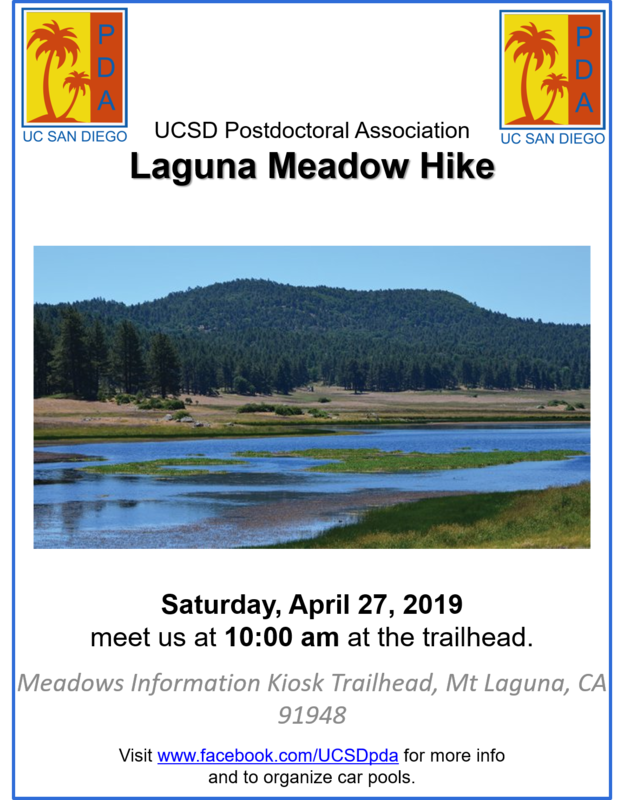 The trail is 6.4 miles long and rated as easy to moderate. After the hike we propose to meet at Julian Pie Company in Santa Ysabel. Meeting point: Eagle Rock Trailhead, Pacific Crest Trail, Warner Springs, CA 92086. Once we have the count we will try to negotiate a group discount. 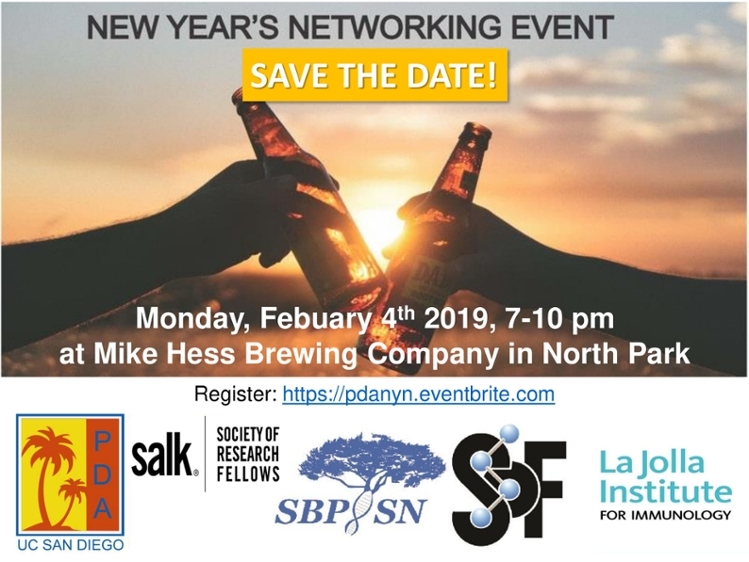 Please join us at our Seventh Annual New Year’s Networking Event on Monday, February 4th from 7-10pm at Mike Hess Brewing Company in North Park. Ring in the new year with fellow postdocs and industry professionals from around the area! In collaboration with postdoc associations at The Scripps Research Institute, La Jolla Institute for Immunology, Salk Institute, & Sanford Burnham Prebys Medical Discovery Institute, we invite you to join us for a New Year's celebration and networking social. 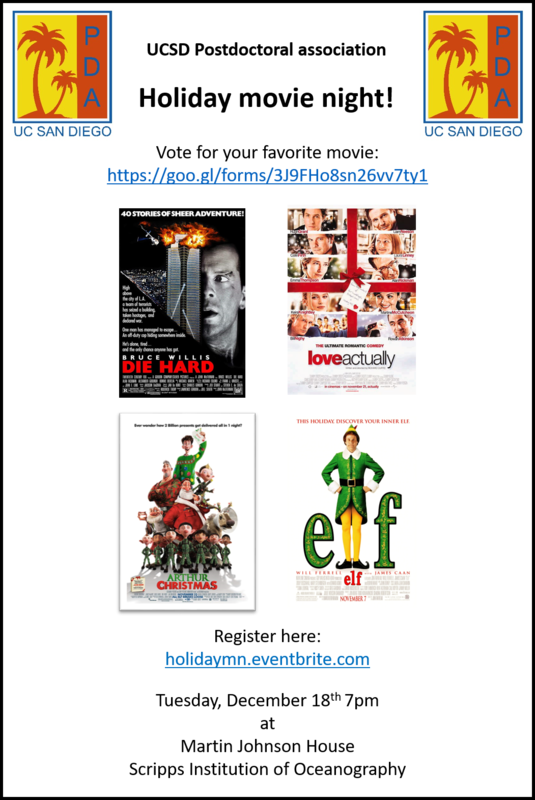 Holidays are coming and the UCSD PDA will host a Christmas movie night! There will be some activities, food and drinks from 7 pm. The movie starts at 7:30 pm. Which movie should we watch? Well, you have the opportunity to pick one of the following: 1) "Die Hard" (1988) John McClane, a New York policeman goes to L.A. on Christmas to regain the love of his wife. You wouldn't believe what happened next 2) "Love Actually" (2003) Follows the intertwined stories of very different couples in Christmastime London. 3) "Elf" (2003) A man raised like an elf in the North Pole goes to New York to meet his family. 4) “Arthur Christmas" (2011) Arthur Claus embarks on a quest to save the Christmas of a young girl that hasn't received her present. Vote here for the movie you would like to watch. The movie that we will show will be announced on Friday 12/14! 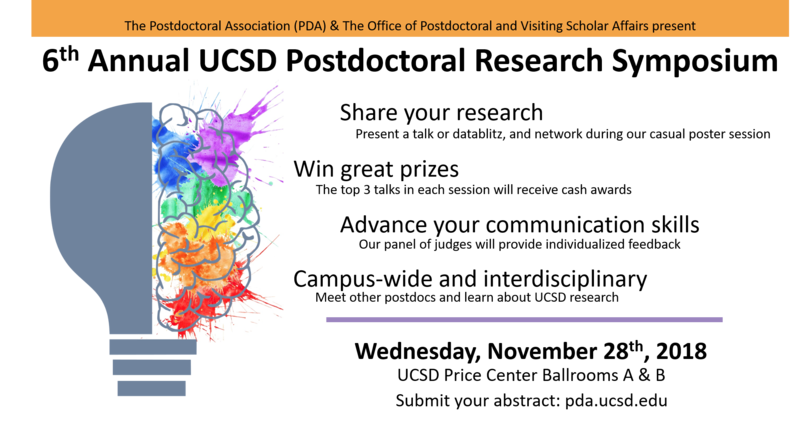 The campus-wide Postdoc Research Symposium is back again on November 28th 2018 (Wednesday, 11 am - 4 pm). This forum will be a perfect opportunity for you to present your work to your peers and industry professionals, discuss and improve your communication skills, network and establish new collaborations, and also win presentation awards and cash prizes. So, take advantage of this amazing opportunity and submit your abstracts now!! Abstract submission deadline is October 31st, 2018. There will be sessions for Oral Presentation (5-7 m), Research Rave (2-3 m), and a casual networking poster session. New this year, we are featuring a panel of judges who specialize in communication, who will be providing individualized feedback to every person who gives an oral presentation. So please, join us for lunch and a fun day of presentations and networking! Presenters will be automatically registered for the Chancellor’s Award Reception, which will follow the symposium. If you have specific questions or are interested in being a judge, please email us at pdaresearch@ucsd.edu. We are looking forward to showcasing your research! Have a beer and hang out with fellow postdocs! Meet new people! 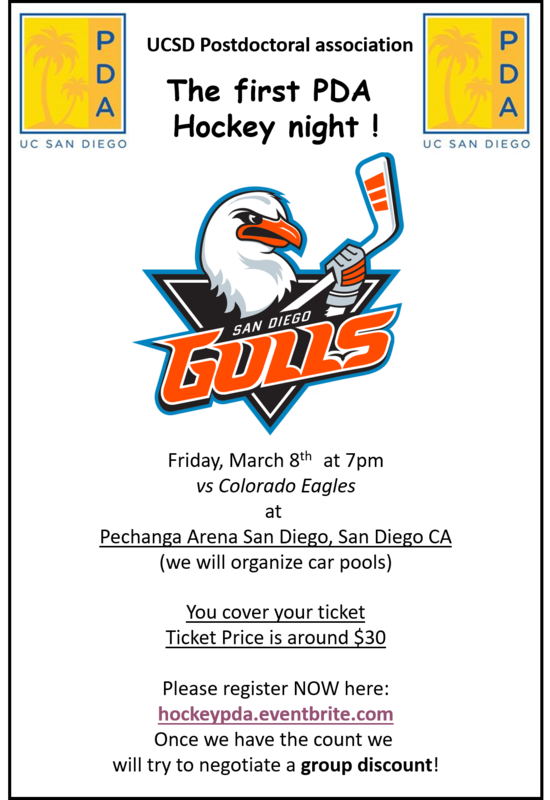 Explore San Diego! 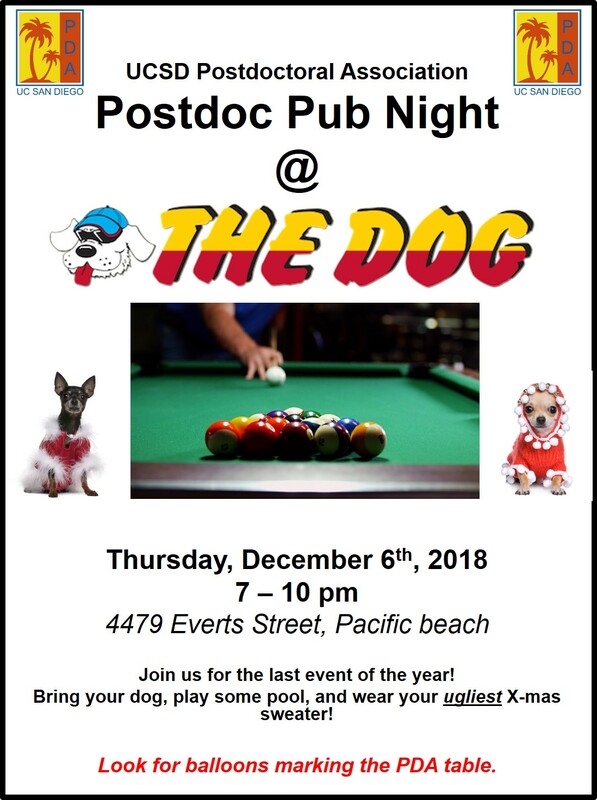 Organized by your Postdoctoral Association (PDA), Postdoc Pub Nights visits pubs in different neighborhoods of San Diego. Come join us!